Friends of the Dog Park, Inc. is a non-profit organization open to all dog lovers and dog owners. 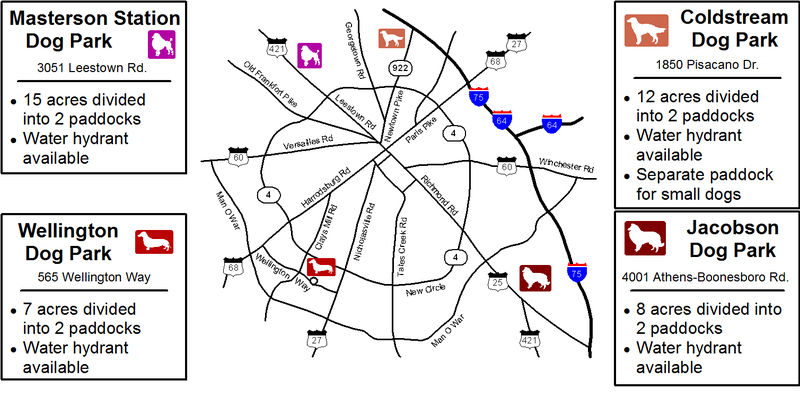 Our primary focus is to create and sustain attractive off-leash areas in Lexington-Fayette County and promote responsible dog ownership through education and recreation. Who are Friends of the Dog Park, Inc.? Friends of the Dog Park, Inc. (FDP) organized in May 2000 and collected 3,000 signatures on petitions supporting off-leash areas. In June 2000 the Parks Advisory Board created a Dog Park Committee to produce a detailed proposal for Dog Parks in Lexington. Composed of members of the Board, the Parks and Recreation Department, and FDP, the committee met for 6 months. We submitted the plan in January 2001 and it was accepted. All we have to do now is raise money for construction and maintenance. Why does Lexington need dog parks? Dog parks allow dogs to exercise and socialize safely. Puppies and adult dogs need enclosed areas to run where they do not endanger themselves or others. Well socialized dogs react well to new situations and people. Dog owners need a place to exercise with their pets, just like baseball, soccer, golf, and tennis enthusiasts need specialized facilities. Dog parks promote responsible dog ownership. Separate off-leash areas are a great way to help everyone visiting the park by ensuring unleashed dogs do not infringe on the rights of other park users. Dog Parks also provide a tool for realistic enforcement of leash laws. With off-leash areas available, there is no excuse for letting dogs run off-leash in public areas. Dog parks provide an outlet for dog owners to socialize. These gathering areas promote a sense of community. Owners exchange information on pet training and health, as well as community events. Users make new friends they would not have met otherwise, and develop a sense of shared responsibility for the parks. Dog parks improve the community and promote public health and safety. Well-exercised dogs are less likely to engage in nuisance behaviors such as constant barking. Those in frequent contact with other dogs and humans are calmer and tend to have better social manners. Dog Parks are also ideal places to conduct dog obedience and puppy socialization classes. All dog parks will be fenced, double-gated, and supplied with dog-waste bag dispensers. All will have clearly posted rules that require owners or handlers to supervise their dogs at all times and to pick up all dog waste, dogs without current tags and shots, or dogs in heat, will be prohibited.